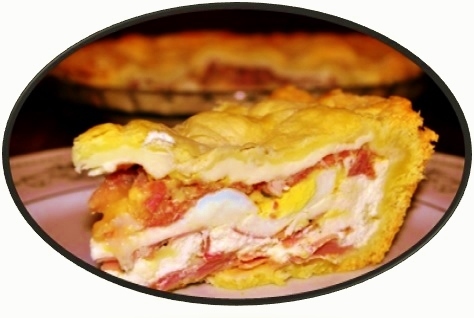 You can’t go wrong with cheese, eggs and sausage in a pie! I first made this recipe back in 2004, and it was a huge hit. This is a traditional Italian menu that is served around Lent and Easter. Below the main recipe is a salad recipe to serve as a side dish that will compliment the smoked ham and cheeses of the pie. Place flour & salt in large bowl. Combine hot water, oil, & yeast in measuring C. with a fork. Add to flour & mix well. If dough is dry, add water as necessary. If dough is too sticky, add flour, one Tbs. at a time. Knead until dough forms ball. Leave in the bowl in warm place to rise until double in volume. Punch down before rolling. Divide dough in half & roll to fit a large pie pan or 15 inch (35 cm) pizza pan. Place one circle on bottom of pan. Top with the filling, pressing out all air pockets. The pie will look too full. Top with remaining dough. Trim around pan with knife leaving about 1 inch (2 cm) extra all around. Press edges to seal & tuck sealed edge in all around pan. Prick top with fork several times to make air holes. Bake @ 200°C for 20 minutes, then reduce oven temperature to 180°C & bake an additional 30 minutes. Mix all chopped ingredients in large bowl. Place uncooked eggs & Ricotta cheese in blender container & mix on medium speed for about 1 minute. Add to the chopped ingredients & combine well. For the salad, rinse the spinach leaves and drain well. Toast walnut pieces in a pan on the stove – no oil, just a dry roast, stirring to make sure they don’t burn; you’ll know when they’re done as they’ll smell wonderful. Allow the nuts to cool before adding them to the salad, or they’ll wilt the spinach. Combine the spinach, nuts, onions, cheese & tomatoes, pour dressing over & toss to coat. Have the authentic taste of a Chinese restaurant sauce in your own home! Several years ago I was preparing to cater for a large group, and I decided on Chinese. As any lover of Chinese cuisine can tell you, spring rolls want sweet and sour sauce; and I needed it in a large quantity, on a limited budget. I searched for this recipe online (it was before the days of the ubiquitous search engine Google); I typed in the title of this post, and came up with several that seemed very close. A bit of experimentation led to the following recipe, and I can promise you, you won’t be able to tell the difference between this and the mix you get in the restaurant! It’s important to use rice vinegar and tapioca starch, both of which can be found in any decent asian shop worth its salt. Dissolve starch in ½ C. of the water. Combine all other ingredients in a saucepan, whisk while bringing to a boil. Slowly stir in the starch mixture. Continue stirring until the sauce thickens & the colour becomes a bit “transparent”. Can be jarred & refrigerated up to 2 weeks. Adjust sugar / vinegar to taste, gradually. It may sound strange, but watermelon rind pie is amazing! Once the rind has been boiled, the consistency is similar to apple, and the taste of the pie will also be comparable to apple pie, considering the spices added. 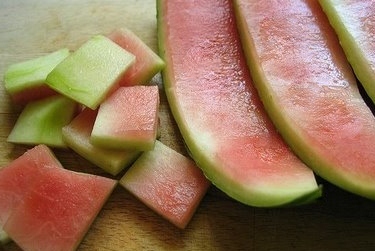 I’m sure you could come up with other uses for watermelon rinds in the kitchen – if you have any other ideas, please let us know in a comment! Why compost it when you can turn it into a great summer dessert! Place rind in a small saucepan; add water to cover. Bring to a boil; cover, reduce heat, & simmer 15 to 20 minutes or until translucent & tender, Remove from heat; drain. Combine rind, sugar & next 8 ingredients, stirring well; set aside. Fit one piecrust in a 9″ pie plate according to package directions. Pour rind mixture into piecrust. Top with remaining piecrust; fold edges under & crimp. Cut small slits in top piecrust with a sharp knife. Bake @ 180°C for 45–50 minutes or until golden, shielding edges of pie with strips of aluminum foil after 25 minutes to prevent excessive browning. Cool on a wire rack.